Front cover features my watercolour portrait of Dee, my wonderful next door neighbour Dee who posed for me whilst doing some baking. 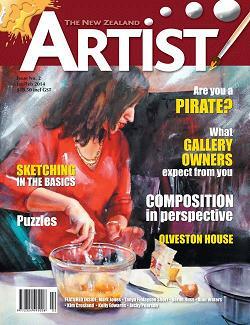 There is also an article about my paintings inside the magazine. A selection of 7 of Jacky's paintings in Denis Robinson's new art book "Artists' Impressions of New Zealand". 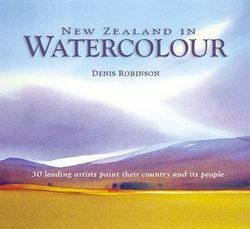 Released early October 2011, "Artists’ Impressions of New Zealand" – the latest in the bestselling range of New Zealand art books. In the manner of an artist’s road trip, this book is a journey from the top to the bottom of New Zealand through the paintings of nearly 60 artists. This painting started as a demonstration to the monthly Outdoor Painting Group of Watercolour New Zealand. It was one of those perfect painting mornings, no wind and clear blue sky. The sheds here are always good to paint and the blue launch made a perfect focal area. "I had a walk around Wellington one evening with my husband Tony and climbed up the part of Dixon St. that zigzags up a footpath towards The Terrace. We had never walked that way before and the idea for this painting with this evening light and bird's-eye view just jumped out begging to be painted. 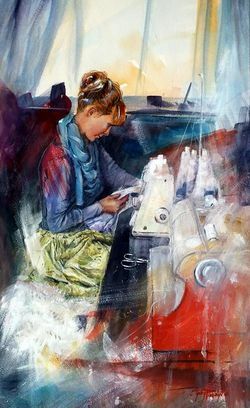 There are so many interesting places like this around the hills and harbours of Wellington that I will never have enough time to to get around to painting them all." 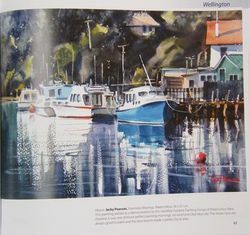 Opposite page: Alfred Memelink "Across the harbour from Mr.Cook"
A stunning collection of the works by 30 of New Zealand’s leading contemporary watercolour artists, painting their country and its people. 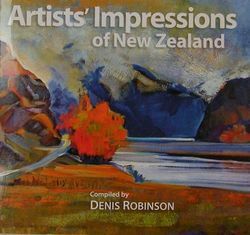 Denis Robinson has sought these out from the large talent pool that exists in New Zealand, with commentaries and captions from the artists give the reader an insight into what attracted them to each subject, how they tackled the painting and their feelings on the completed works. 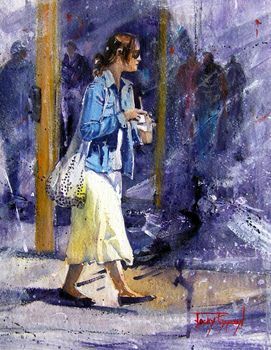 "Lunchtime Girl" was selected to be included in Splash 11, New Directions, The Best of Watercolor. The Splash series showcases the finest watercolor paintings being created today. You will gain insight into methods of the best contemporary watercolor artists in the 11th edition of this top-selling series. You'll find over 120 exciting and diverse examples as the artists reveal what inspired their paintings and what helped inject their work with fresh energy. 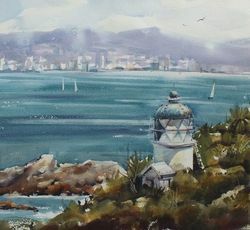 Series of the three Lighthouses of New Zealand calendars (2000, 2001 and 2003) was a result of a five year project to capture, in watercolour, New Zealand's historic lighthouses, many of them dating to 1865. It involved helicopter, boat and 4-wheel drive trips to the various sites. Jacky also researched and wrote a history of all these lighthouses and interviewed many ex-keepers.